The role that service dogs can play in the lives of people with invisible disabilities has started to receive national media attention in the New York Times, the Wall Street Journal, The New Yorker, and on Oprah. Service dogs have been assisting the blind, the hearing impaired and those in wheelchairs and with other disabilities for decades. More recently, they’ve helped many veterans returning from combat to overcome the effects of PTSD, and return to more fulfilling lives. 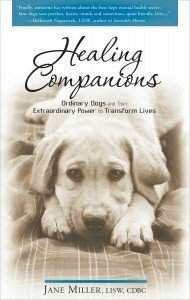 We are proud to say that Healing Companions: Ordinary Dogs and Their Extraordinary Power to Transform Lives is the first book to profile the power these extraordinary dogs have to transform lives. This groundbreaking book provides a window onto the new world of Psychiatric Service Dogs (PSDs), and how they can offer a second chance at life to some of society’s most vulnerable people. For people with living with or caring for someone with psychiatric disabilities such as depression, post-traumatic stress, bipolar disorder, anxiety, panic attacks and more, this book offers hope, and shares success stories of how these dogs have changed and enhanced the lives of their human companions. 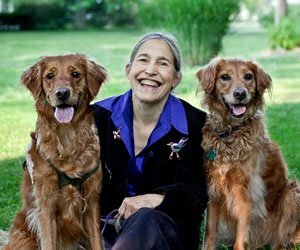 In Healing Companions, licensed psychotherapist and psychiatric service dog trainer, Jane Miller introduces these amazing dogs, and explains how they have helped vulnerable people improve their lives in profound and unexpected ways. PSDs have allowed them to gain self-esteem, self-confidence, assertiveness and so much more. These dogs provide emotional support, as all dogs do, but they are specifically trained to perform certain tasks unique to each individual’s needs. Through the stories of these individuals and their dogs, we hope you can see how a friend or a family member might benefit from working with such a healing companion. Healing Companions discusses how these dogs are trained, how the dogs may impact other members of the family, and how our training can make life more comfortable and less stressful for the dogs, while they are undertaking their essential tasks. A helpful list of resources for further information, support, and services is provided. In addition to these remarkable stories, this book also explains which dogs are the right candidates for the job, which dogs are not, and how to tell the difference. For those who may not know about the profound benefits that these dogs can bring, as well as anyone who loves dogs and enjoys learning about their value to their companions, this book will serve as an informative, practical, and inspirational guide. Order your copy of Healing Companions at Amazon, Barnes and Noble, Powell’s and bookstores nationwide.